Thanks to some good feedback from my friends at Sierra Foothill Conservancy, I'm pleased to announce a new suite of features in Stewardship activities that add a ton of flexibility to Monitoring Visits. Have you ever wanted to record something as a monitoring visit, but not "count" it as your annual monitoring visit? Until now, there was no way to distinguish one monitoring visit from another. And, if you were querying out Stewardship activities by Last Monitored Date, then these extra monitoring visits could throw off your results. Do you ever have multiple types of "monitoring" visits that you have to do on a single property? This comes up a lot for land trusts that work on mitigation projects. Now, Monitoring Visits have a Type field. By default, all of your prior visits have been given the type "Annual Monitoring," but you can put in whatever Types make sense for your work. 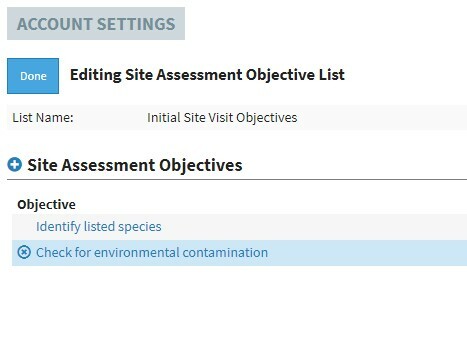 There are now multiple Default Monitoring Objectives lists that are tied to particular Types of Monitoring Visits. 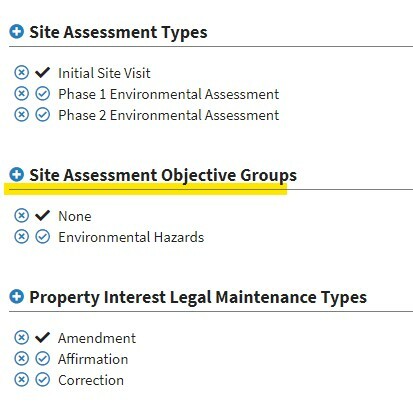 By default, any Monitoring Objectives you had defined were moved into a list for "Annual Monitoring" visits. But, if you want a different set of Objectives for each Type, you can. 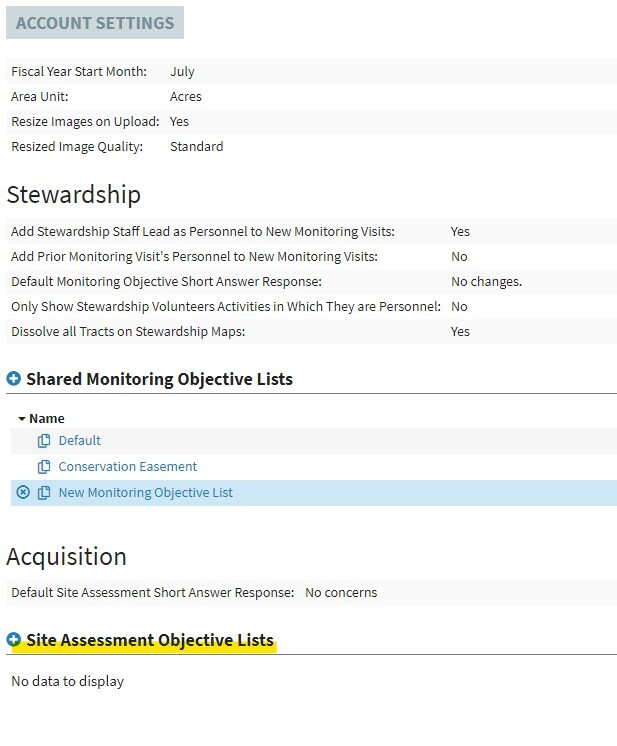 Since a single Stewardship activity may have multiple obligations associated with it - not just a single annual monitoring visit - there is a new section called "Stewardship Obligations" on the Details page. By default, all Stewardship activities received a single obligation called "Annual Monitoring" which utilized any monitoring window and monitoring interval data you had set. Stewardship Obligations will be "satisfied" by certain Types of Monitoring Visits. 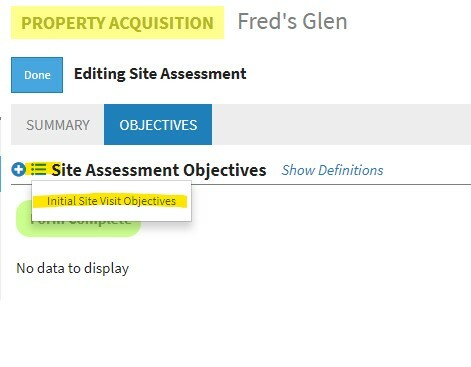 This is how you'll keep track of what properties require monitoring. When you complete a visit that satisfies any of your Obligations, the Completed On date will automatically be filled in for you. After an Obligation date has expired, it will be reset to the next interval and the Completed On date will be reset. If you did not satisfy an obligation before the Complete By date, that date will be recorded in the Missed Obligations list in the details of the Obligation. The fields on the Details page for Monitoring Interval and Monitoring Window have been removed. The data still exists in your Stewardship activities so any queries or reports that you currently have that utilize these fields still work. However, you should transition them as soon as possible to using the new Stewardship Obligations format. 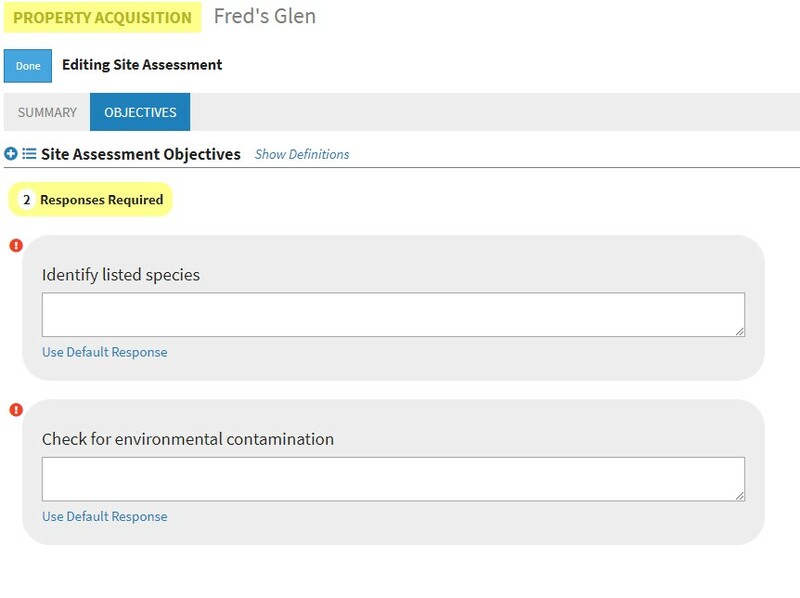 These changes mean the Stewardship Dashboard widget will also need some updating so it can display your new obligations in meaningful ways. Stay tuned for that! Clicking on a pin or polygon will display the details in a panel on the right. The fields you chose for your view will be the ones displayed in the table. The name of the result is a link that will take you to its main details page. The map is currently available for Property Acquisitions, Stewardships, Dispositions, Tracts, Monitoring Visits, Monitoring Issues, and Management Actions. There are a few different ways to get new data into your LANDSCAPE maps. One of the easiest ways to create new points on a map is to simply import a set of geotagged photos. Doing so will create new points for each photo, but it will try its best to combine multiple photos into a single point if they are "close enough." However, GPS accuracy can be variable in the field when you are taking your photos, so even though you may never have moved from a certain spot as you took photos, the actual GPS location stamped into the photo may have moved around your general location. This can happen when you are taking photos in LANDSCAPE Mobile as well. If photos that should have been grouped together aren't, they become a little cumbersome to work with in LANDSCAPE, but don't despair! There is now a way to merge points together. Now, drop it and you'll be prompted to merge the two together. The destination point will obtain all the photos from the source point and the source point will be removed from the map.